This weekend George Clooney will again leverage his star power, this time in a feature, “I Spy: George Clooney turns long-lens photography into a force for good, aiming satellites at human-rights violations in Sudan” by John Horn in the LA Times Magazine. The article, online now, will appear in the Sunday Edition of the LA Times. The profile leads with a description of Clooney and Enough Project Co-Founder John Prendergast’s inspiration to start the Satellite Sentinel Project while on a trip to Sudan in 2010. “It’s spying if it’s a country. It’s spying if it’s the United Nations, maybe. But what if I’m a paparazzo with a lens 400 miles up? How is that spying? I’m just a tourist taking pictures and putting it on the Web. 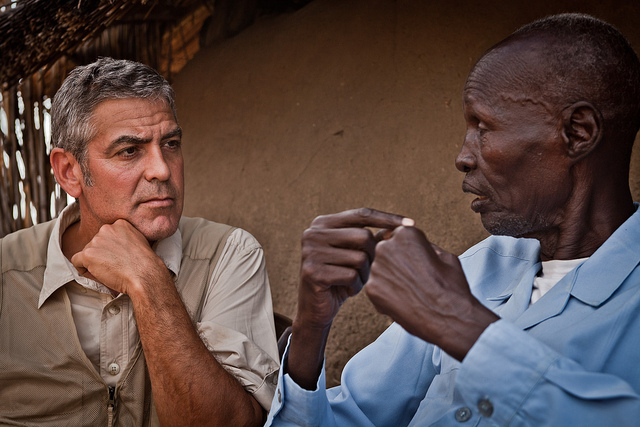 I don’t understand where that’s wrong,” wondered Clooney as he looked up at the stars outside a mud hut in Sudan. The profile notes the successes of SSP including the August reports showing evidence of mass graves, and the October report showing Sudan’s Central Reserve Police committing war crimes near a U.N. compound. The most recent report, released December 1, shows Blue Nile Burning: Evidence of the Destruction of ‘Amara Village. The magazine also features images from Clooney’s trips to Sudan, taken by Enough Project photographer Tim Freccia. Though his rise to fame has been through acting, “Clooney is now the ultimate celebrity photog­rapher, except his lenses are focused not on red carpets but on distant atrocities,” Horn writes.